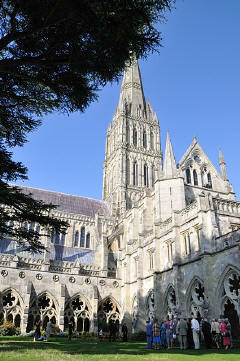 Salisbury cathedral is for most the first cathedral that comes to mind, partly because of the two paintings by John Constable, partly its tall spire standing so tall and perhaps its the constant comparison to it. Today it has Britain's tallest spire (123m/404ft), there were taller ones, for example Amesbury abbey, but they have fallen down. Although inside it you might imagine it to be the largest its not as long or as wide in fact as many others, so the extreme size is an illusion. To get to the history, we need to look 2 miles to the north, on the top of a very windy hill, at a hill fort known now as Old Sarum. Sarum as it was, has been inhabited from around 3,000 BC, the Romans knew it when here as Sorviodunum. Following the Roman occupation, Cynric, King of Wessex, was said to have captured the place in 552. 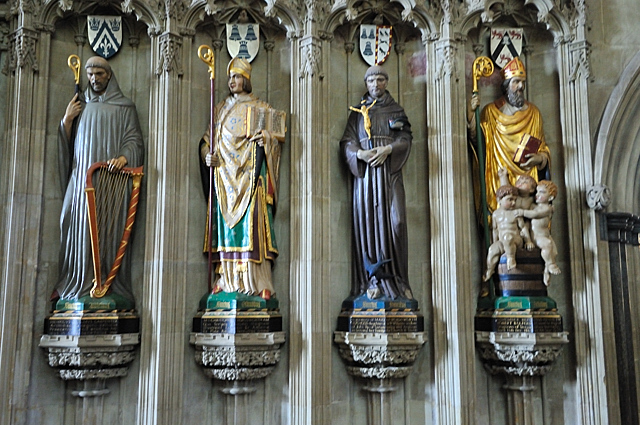 Under the Saxons it ranked among the most considerable towns of the West Kingdom, and it gained ecclesiastical establishments soon after the conversion of the Saxons to Christianity. We don't know who first established a Christian site here, but given its not that far from Glastonbury its likely to have the presence of Celtic Christians well before the Catholics arrived. Later a motte and bailey castle was built, in around 1069, shortly after the Norman conquest, and the town was renamed. 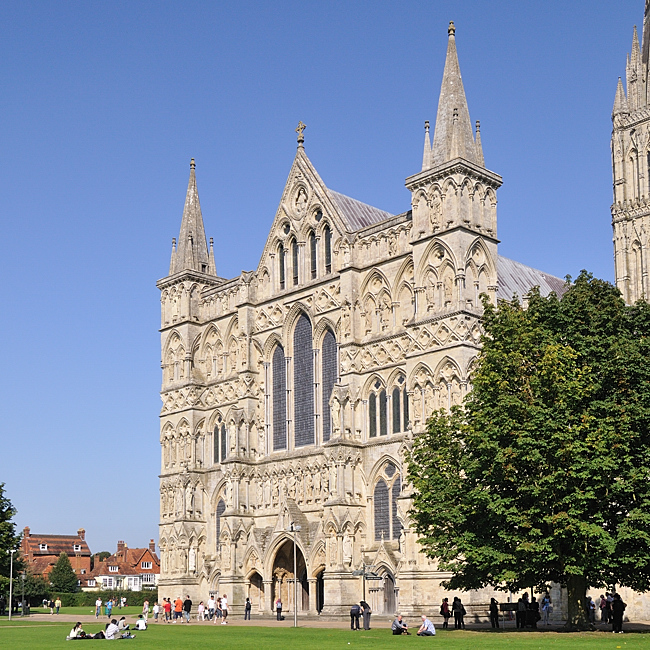 It is listed in the Domesday Book as Sarisburia, from which the names Sarum and Salisbury are derived. In 1086, William the Conqueror convened the prelates, nobles, sheriffs, and knights of his dominions at Old Sarum to pay him homage. It is probable that part of the Domesday Book was also written at this time. 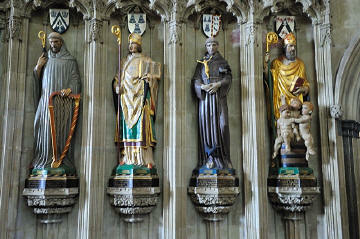 Two other national councils were held there, one by William Rufus in 1096, and another by Henry I in 1116. The construction of a cathedral and bishop's palace occurred between 1075 and 1092, during the time of Bishop Osmund. 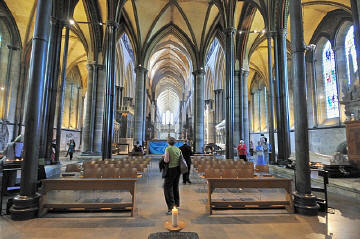 However, only five days after the cathedral was consecrated, a storm destroyed the tower roof. The final completion of the cathedral was left to the third bishop of Old Sarum, Roger of Salisbury, chancellor to King Henry I. He also oversaw the construction, between 1130–1139, of a stone Royal Palace on the hill site. By 1219 there was a lot of conflict between the people in the cathedral and the castle next door. The then bishop got permission to locate the cathedral, and the legend is that he said he would fire an arrow into the air and where it fell he would build the new cathedral. Presumably the king thought this would be at the bottom of the hill. 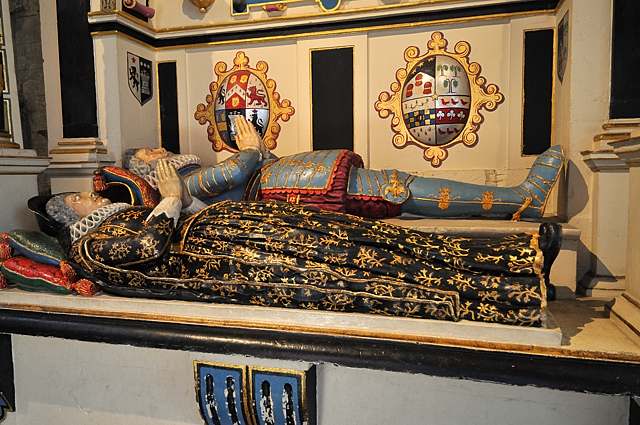 Legend has it that he fired the arrow but it hit a deer and they then tracked the deer to the point that it fell and died, and that is the location that was chosen for the cathedral. The cathedral was then constructed, people moved down around it, becoming New Sarum and the old Sarum site slowly died out. New Sarum eventually being renamed Salisbury. We have another feature guide that looks specifically at Old Sarum. Today the foundations and a bit more of the old cathedral at Old Sarum can be seen. The foundation stone was laid on 28 April 1220. 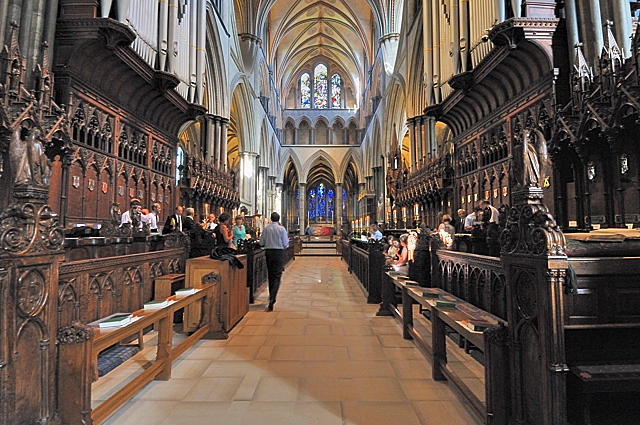 Due to the high water table in the new location, the cathedral was built on only four feet of foundations, and by 1258 the nave, transepts and quire were complete. The west front was ready by 1265. The cloisters and chapter house were completed around 1280. 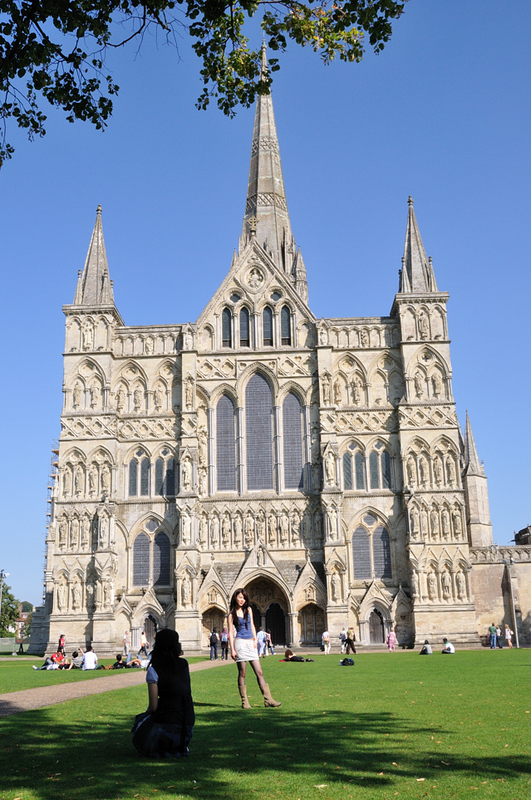 Because the cathedral was built in only 38 years, Salisbury Cathedral has a single consistent architectural style, early English Gothic. The only major sections of the cathedral built later were the Cloisters, Chapter house, tower and spire, which at 404 feet (123 metres) dominated the skyline from 1320. While the spire is the cathedral's most impressive feature, it has also proved to be troublesome. Together with the tower, it added 6,397 tons (6,500 tonnes) to the weight of the building. Without the addition of buttresses, bracing arches and iron ties over the succeeding centuries, it would have suffered the fate of spires on other great ecclesiastical buildings, such as Malmesbury Abbey, and fallen down, instead, Salisbury is the tallest surviving pre-1400 spire in the world. To this day the large supporting pillars at the corners of the spire are seen to bend inwards under the strain. The addition of tie beams above the crossing led to a false ceiling being installed below the lantern stage of the tower. The spire today leans 69.85cm (27.5ins) to the south and 44.44cm (17.5ins) to the west. Significant changes to the cathedral were made by the architect James Wyatt in 1790, including replacement of the original roof screen and demolition of the bell tower, which stood about 320 feet (100 metres) north west of the main building. 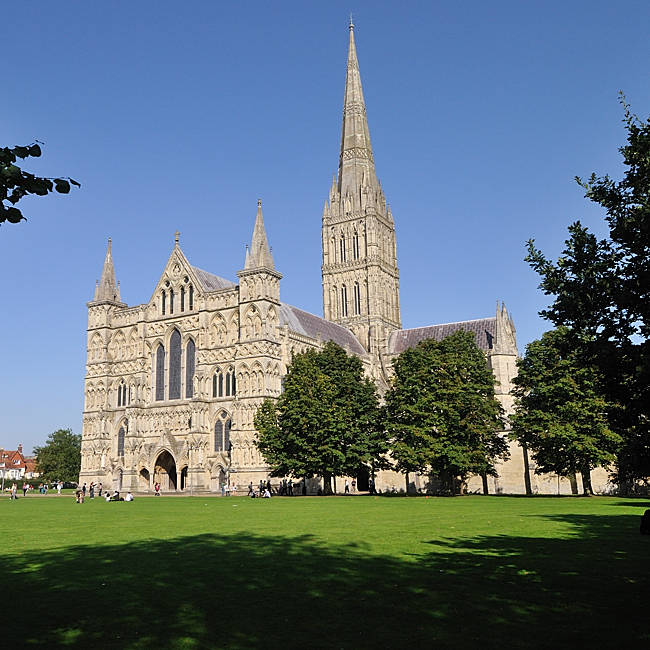 Salisbury is one of only three English cathedrals to lack a ring of bells, the others being Norwich Cathedral and Ely Cathedral. 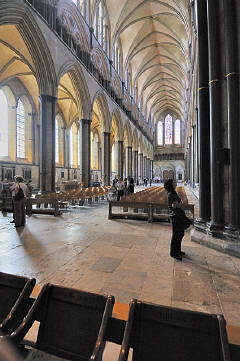 The chapter house is octagonal, has a slender central pillar and decorative medieval frieze. The frieze circles the interior, just above the stalls, and depicts scenes and stories from the books of Genesis and Exodus, including Adam and Eve, Noah, the Tower of Babel, and Abraham, Isaac and Jacob. It has the oldest working clock in the world, from a period before clocks had faces, instead it just opiates bells. Click here to get a full description of this device, the slightly later Wells Cathedral clock was probably by the same maker, and has a face. The Wells clock face is in place and working but the original mechanism, which also still works is for some reason in the Science Museum in London. These two clocks between them show the development of clocks. You can climb the tower, for a fee, and look up onto the wooden structure that makes up the spire. You can see over a wide area, and on one part of the journey I think you must travel along the inside high up on west front in front, just below and level with the large window, as I saw children running along this level. The treasury (silverware) is on display in the chapter house. There were several different agreements called the Magna Carta, all very similar. Of the version that most tend to think of there are only a few copies in existence and the one of these in best condition is on display in Salisbury Cathedral. This can be seen in the chapter house but no photography is allowed in the chapter house. Elias of Dereham, who was present at Runnymede in 1215, was given the task of distributing some of the original copies. Later, Elias became a Canon of Salisbury and supervised the construction of Salisbury Cathedral, bringing with him one of the copies. The Magna Carta was written on vellum, a very expensive type of leather. It was all written in Latin, but it was only in place for nine weeks. It was written with a pigeon feather as a goose feather was too thick. Francis Bacon was the first to try to use Clause 39 to guarantee due process in a trial. From the earliest times to today, politicians to police all have disregarded it, even where it applied and it only ever did provide a fraction of the protection that is often claimed, and has little if any affect today. A dead rat which carried traces of arsenic was found inside the skull of William Longespée when his tomb was opened centuries later. It was on a rough field called St. Mary's Mead in 1220 AD that Bishop Richard Poore and his brilliant architect Elias de Derham decided to build a new state-of-the-art Gothic style Cathedral to replace the old Norman Cathedral at Old Sarum. Once the building was finished the Bishop recruited priests, canons, and clerks to serve it. These church workers were given an acre and a half of land with the more senior clergy being given three acres around the perimeter of The Close. The Bishop built himself a great palace, which now houses the Cathedral School. Today only four members of the Chapter are resident in The Close and other properties are mainly leased from the Cathedral by private residents. As you look around The Close today you see a great array of English Architecture, some designed by Sir Christopher Wren, dating from the 13th to the 20th century. The oldest building in The Close is the Medieval Hall as many of the older houses have been pulled down or rebuilt over the years. Follow ring road to south and then go into city. Open every day of the year, usually 7.15am-6.15pm, for recommended opening times because of services click here to see the opening times for different parts on specific dates and click here to see closures. Requested donation of Adults £6.50; children (5-17) £3; students and seniors £5.50. Free exhibition in part of cloisters. You can go from one part of the cloisters to another, accessing WC etc and green central part, without going through donation request, and this connects up with a second way into main cathedral. There is a separate charge for a tower tour (£10 for Adults, £8 for Children & Seniors) height and minimum age restrictions apply. 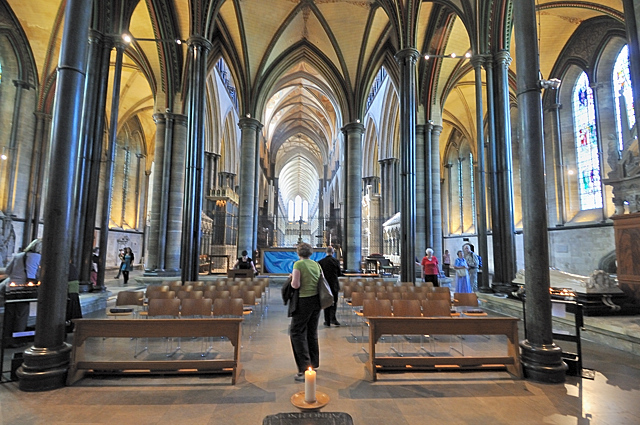 Their website says " You are welcome to take videos and photographs for your personal use during your visit to Salisbury Cathedral, except in the Chapter House and during services" there is no cost. Special Needs Access: To the ground floor should not be a problem check the website or contact them if you want to go elsewhere.